Scientists from the University of Wisconsin assessed the diverse carrot germplasm's response to salinity stress and identified the salt-tolerant carrot germplasm that may be used by breeders. They also defined the appropriate screening criteria for assessing salt tolerance in germinating carrot seed. Their research is published in HortScience. Lead scientists Adam Bolton and Philipp Simon emphasized that one of the effective ways to combat the effects of salinity stress in glycophytic crops like carrot is by identifying new genetic sources of tolerance and efficient phenotypic methods to develop salinity-tolerant cultivars. "In previous studies, carrots have been characterized as a crop that is sensitive to salinity. This study evaluated a large collection of wild and cultivated carrot germplasm and confirmed that, in fact, many carrot cultivars are saline-sensitive during seed germination, but that many germplasm accessions evaluated were quite saline-tolerant. Interestingly, many of the more saline-tolerant carrots evaluated were cultivated carrots, perhaps reflecting unintentional selection by farmers that have been growing the crop with saline irrigation water. This study provides an optimistic outlook for breeding carrots with improved salinity tolerance during germination. Tolerance during seeding and later plant development will also be needed as salinity becomes a more serious challenge for farmers," Simon said. Read the research article in HortScience. Researchers at Cold Spring Harbor Laboratory (CSHL) have identified a relationship between maize crop yield and the specific genetic activity associated with one of the plant's metabolic pathways. Maize ears are normally not branched, and form one straight cob. However, maize mutants that don't have the RAMOSA3 gene end up with gnarly-looking branched ears. 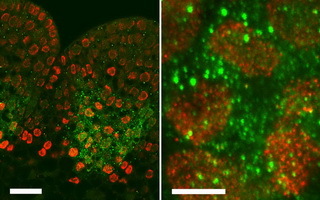 Professor David Jackson and his team at CSHL have connected the RAMOSA3 gene to branching, which can affect maize yields. When a maize plant has too many branches, it expends more energy towards making those branches, and less towards making seeds. More branches often means lower yields. 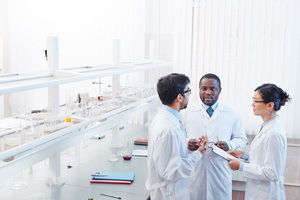 Professor Jackson and his team initially hypothesized that the enzyme that RAMOSA3 encodes, called TPP, and a sugar phosphate called T6P which TPP acts on, are likely responsible for the ear-branching. In a surprising twist, they found that a related gene, TPP4, also helps to control branching, but that gene's effect was unrelated to its enzymatic activity. To follow up on this, they blocked only the enzyme activity associated with RAMOSA3, and not the gene itself, and got normal-looking ears of maize. This indicates that although RAMOSA3 controls the activity of the enzyme, the enzyme activity is not responsible for branching. Thus, the gene may be "moonlighting" with a hidden activity, explains Jackson. For more details, read the CSHL news article. Forty-three delegates from 10 Asian countries composed of farmer-leaders, scientists and the academia, media, as well as representatives from government and private institutions gathered for the week-long 13th Pan-Asia Farmers' Exchange Program held on April 1-5, 2019 in Manila, Philippines. Discussions focused on communicating biotech in the Philippines, the country's biosafety regulations for biotech crops, insect resistance management program, the current status of agri-biotech in each country, and plant breeding innovations. The group also went to a commercial Bt corn farm in the province of Tarlac and paid a visit to the International Rice Research Institute as well as the Corteva Seed Processing Plant to learn about their projects and see the research facilities first-hand. For more details about biotechnology developments in the Philippines, visit the SEARCA BIC website. 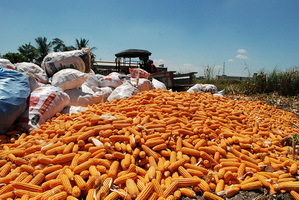 The European Food Safety Authority (EFSA) Panel on Genetically Modified Organisms (GMO Panel) has published the Scientific Opinion on the safety of six-event stack genetically modified (GM) maize Bt11 × MIR162 × MIR604 × 1507 × 5307 × GA21 and its subcombinations independently of their origin. The scientific opinion is published based on the application EFSA‐GMO‐DE‐2011‐103 under Regulation (EC) No. 1829/2003 from Syngenta Crop Protection AG. The scope of application EFSA‐GMO‐DE‐2011‐103 is for food and feed uses, import and processing in the European Union of the GM herbicide‐tolerant insect‐resistant maize Bt11 × MIR162 × MIR604 × 1507 × 5307 × GA21 and all its subcombinations independently of their origin. The GMO Panel has previously assessed the six single events and 22 of their subcombinations and did not identify safety concerns. No new data on the single events or their 22 combinations that could lead to modification of the original conclusions on their safety were identified. The GMO Panel concludes that the six‐event stack maize is as safe as and nutritionally equivalent to its non‐GM comparator and the non‐GM reference varieties tested. Plants have developed a complex system that when exposed to extreme environments such as hot temperatures, their energy is diverted towards survival instead of being used for growth. Scientists from Nara Institute of Science and Technology (NAIST) in Japan reported that two transcription factors, ANAC044 and ANACO85, are vital in such mechanism in Arabidopsis, and this provides clues on how to modulate growth of important agricultural crops. The results of their study is published in eLife. In previous studies, NAIST Professor Masaaki Umeda and team reported that SOG1 is activated by DNA damage and regulates almost all genes induced by the damage, while Rep-MYBs are stabilized in DNA damage conditions to suppress cell division. In the latest study, Umeda's research team shows that ANAC044 and ANAC085 act as a bridge between SOG1 and Rep-MYB. They found that ANAC044 and ANAC085 are essential for root growth retardation and stem cell death, but not for DNA repair. Specifically, ANAC044 and ANAC085 were responsible for preventing the cell cycle from proceeding from G2 phase to mitosis in response to the DNA damage. This implies that ANAC044 and ANAC085 serve as gatekeepers in the progression from the G2 phase in the cell cycle under abiotic stress conditions. The study shows a new mechanism that optimizes organ growth under stressful conditions. Thus, the researchers recommend other scientists to consider ANAC044 and ANAC085 in increasing plant productivity. For more details, read the original article from NAIST and the research article in eLife. Researchers from the University of Cambridge and Imperial College London, together with AstraZeneca, have used mathematical modelling and genome engineering to edit yeast cells to help scientists control not just what the cells sense but how they react to what they sense in a more desirable way. Yeast senses its environment using G protein-coupled receptors (GPCRs). GPCRs enable cells to sense chemical substances such as hormones, poisons, and drugs in their environment. They can also act as light, smell, and flavor receptors. The Cambridge team developed a mathematical model of the yeast cell with varied concentrations of different cell components and found the optimum levels for the most efficient signalling of each one. This information was then used by researchers at Imperial College London to genetically modify cells. Dr. William Shaw, a researcher at Imperial College London said the new information enabled them to understand exactly how to genetically engineer a cell so it senses something in a way that can be controlled. Through the computational findings, the team created a highly-modified strain of yeast with all the non-essential interactions within the GPCR signalling pathway removed. This allowed them to predictably alter the way cells responded to their environment. For more details, read the news release from the University of Cambridge. Over the recent years, plant research and its associated technologies have improved drastically as a result of revolutionary breakthroughs such as new gene editing technology and the reduction in the cost of sequencing. As a result of many plants have now been successfully sequenced and a wide range of biological data-set made available, plant scientists are now making use of state of the art technology platforms to help explain biological principals, advance research and therefore enable benefits such as crop improvement and breeding techniques. Meanwhile, the mass variety of microbes within the plant and soil are not only crucial in plant growth, yield & health, but also in pest management and fixation cycles. The crop quality improving technologies and the new pest control technologies are now becoming important tools to farmers. This year, Global Engage, the University of Nottingham (Malaysia), and Crops for the Future, are pleased to announce that the congress is co-located with Microbiome for Agriculture Congress Asia 2019. This congress is part of our highly respected Plant Genomic Series held in Europe each May and the US every September each year. Join the congress in Kuala Lumpur, Malaysia on July 29-30, 2019! With ISAAA as the official media partner for this event, all Crop Biotech Update subscribers are entitled to get 10% off (valid till before event date) by applying the discount code SK/ISAAA/10 when you register online.